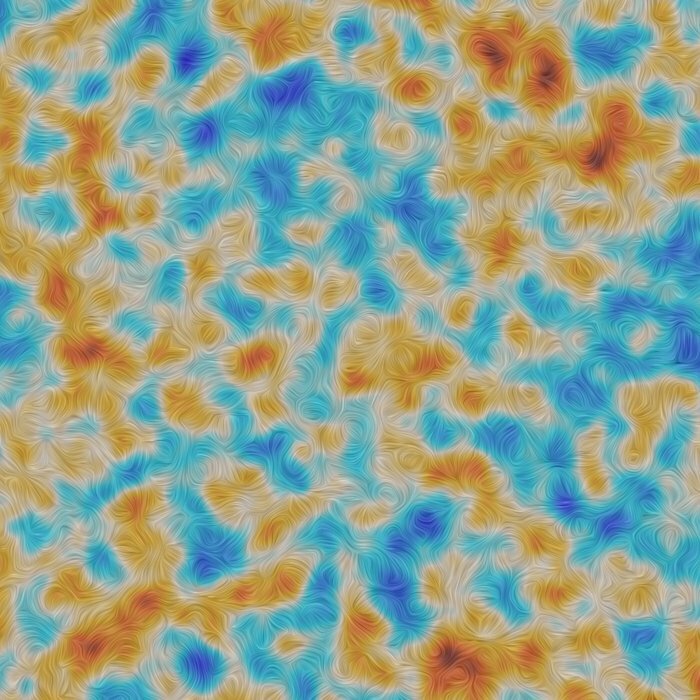 A visualisation of the polarisation of the Cosmic Microwave Background, or CMB, as detected by ESA’s Planck satellite on a small patch of the sky measuring 20º across. The CMB is a snapshot of the oldest light in our Universe, imprinted on the sky when the Universe was just 380 000 years old. It shows tiny temperature fluctuations that correspond to regions of slightly different densities, representing the seeds of all future structure: the stars and galaxies of today. In this image, the colour scale represents temperature differences in the CMB, while the texture indicates the direction of the polarised light. The curly textures are characteristic of ‘E-mode’ polarisation, which is the dominant type for the CMB. In this image, both data sets have been filtered to show mostly the signal detected on scales around 20 arcminutes on the sky. This shows the fine structure of the measurement obtained by Planck, revealing fluctuations in both the CMB temperature and polarisation on very small angular scales. ESA has backed the development of a ‘metamaterial’ device to sift through the faint afterglow of the Big Bang, to search for evidence of primordial gravitational waves triggered by the rapidly expanding newborn Universe. “This technological breakthrough widens the potential for a future follow-on to ESA’s 2009-launched Planck mission, which would significantly increase our detailed understanding of the Universe as it began,” explains Peter de Maagt, heading ESA’s Antennas and Sub-Millimetre Wave section. 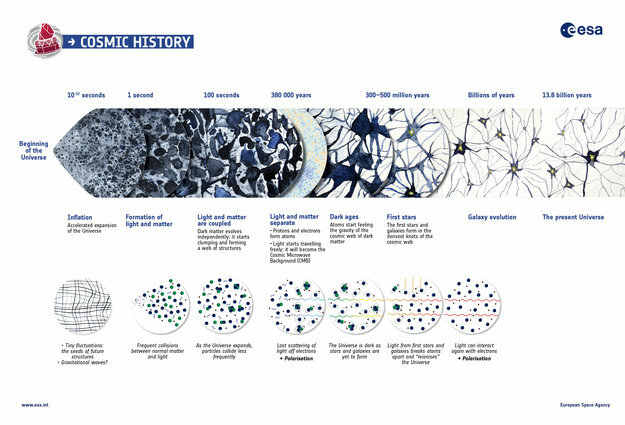 Planck mapped the ‘cosmic microwave background’ (CMB) – leftover light from the creation of the cosmos, subsequently redshifted to microwave wavelengths – across the deep sky in more detail than ever before. The CMB retains properties of ordinary light, including its tendency to polarise in differing directions – employed in everyday life by polarised sunglasses to cut out glare, or 3D glasses used to see alternating differently polarised cinema images through separate eyes. Cardiff University’s magnetic mirror half-wave plate design for b-mode polarisation modulation across wide bandwidths. Less than 1 mm thick, this metamaterial-based design employs a combination of a grid-based ‘artificial magnetic conductor’ and metal ‘perfect electrical conductor’ surfaces. The overall effect is to create a differential phase-shift between orthogonal polarisations equal to 180 degrees. The rotation of the plate causes modulation of the polarisation signal. Researchers are now searching for one particular corkscrew polarisation of the CMB, known as ‘B-mode polarisation’, predicted to have been caused by gravitational waves rippling through the early Universe as it underwent exponential expansion – surging from a subatomic singularity to its current vastness. Identifying these theorised ‘stretchmarks’ within the CMB would offer solid proof that expansion did indeed occur, bringing cosmologists a big step closer to unifying the physics of the very large and the very small. “This would be the holy grail of cosmology,” comments Giampaolo Pisano of Cardiff University, heading the team that built the new prototype B-mode polarisation device for ESA. One of the main obstacles in detecting primordial B-modes is additional sources of polarisation located between Earth and the CMB, such as dust within our own galaxy. Such polarised foreground contributions have different spectral signatures to that of the CMB, however, enabling their removal if measurements are taken over a large frequency range. The challenge is therefore to devise a polarisation modulator that operates across a wide frequency bandwidth with high efficiency. 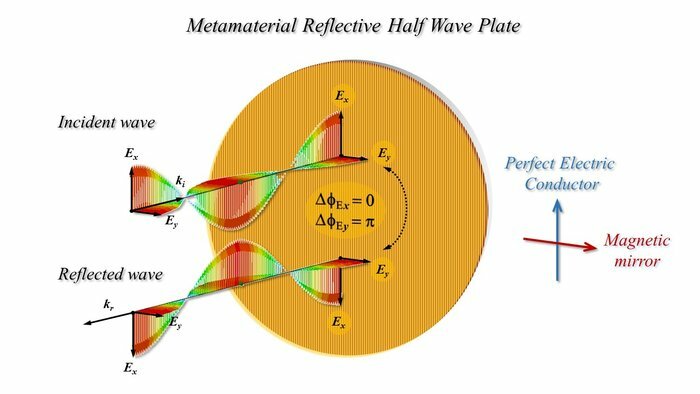 “Our new ‘magnetic mirror’-based modulator can do just that, thanks to the quite new approach we adopted,” said Giampaolo Pisano. Polarisation modulation is often achieved with rotating ‘half-wave plates’. These induce the rotation of the polarised signals which can ‘stick out’ from the unpolarised background. However, the physical thickness of these devices defines their operational bandwidths, which cannot be too large. “Our new solution is based on a combination of metal grids embedded in a plastic substrate – what we call a ‘metamaterial’ – possessing customised electromagnetic properties not found in nature. The team’s prototype multiband magnetic mirror polarisation modulator measures 20 cm across. Any post-Planck space mission would need one larger than a metre in diameter, its design qualified to survive the harsh space environment. The team are now working on enlarging it.